The actor in leading role in MBC drama The Moon that Embraces the Sun (The Sun and the Moon), Kim Soo Hyun is happy that the drama becomes a hit sensation, but with the excellent performance of child actors, but the request to “increase the share of child actors” has increasing, adding a lot of pressure. Up until episode 3 broadcast on January 11th, 2012, The Moon that Embraces the Sun is staging a warm romantic family drama. It’s learned that the love story is happening between 15-year-old crown prince Hwon (Yeo Jin Goo) and 13-year-old Yeon Woo (Kim Yoo Jung), and the 16-year-old Yang Myung who unrequited love Yeon Woo. Atthe age of about 10, their fresh and pure love is enriching, and at times pathos, attracting audience’s attention. In this case, it’s impossible for the adult actors to laugh. The initial stage of the drama has high ratings, there are various reasons that made the drama well received, but obviously the immerse and excellent acting of child actors is major factor. In the past, the dramas have differentiation of child and adult actors have required a long time for audience to immerse into the drama again. 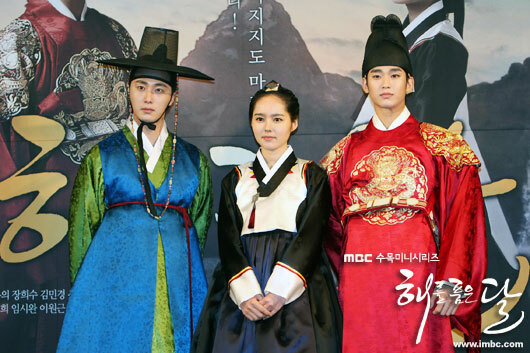 For this reason, after the broadcast of The Moon that Embraces the Sun last week, viewers have expression mixed opinions that included anxiety and concerns, “The performance of child actors is really good, really worry for the adult actors who replace them in 6th episode,” “Han Ga In, Kim SOo Hyun, Jung Il Woo seem to be a little bit nervous,” “What is there is awkwardness after adult actors debut?” and so on. In this atmosphere, the director Kim Do Hoon recently tweeted on Twitter, “Jung Il Woon, Song Jae Rim, Nam Bo Ra will meet everybody for the first time on the mid of episode 6. Their performance is much better than expected. The high popularity of child actors has made them very nervous.” The official of TV series also hopes that the adult actors can perform excellently to continue maintain the high ratings.